I wanted to quit drinking… I wanted the problem to be just taken away, like magic. I listened to what people in the program were telling me, that I could ask my Higher Power to remove my obsession to drink and return me to sanity. I wanted these things so badly, but what became a huge road block was that, sadly, I did not truly believe in my Higher Power. 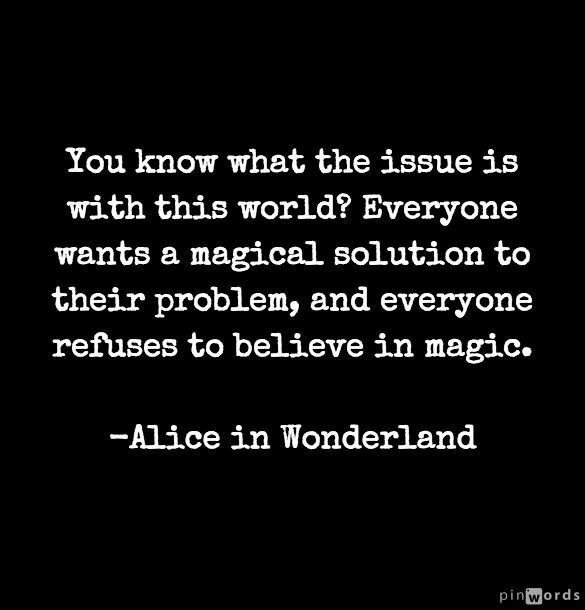 I love the above quote from Alice in Wonderland! It says it all, actually. I wanted my problems to go away like magic, but was unwilling to believe that magic existed. Is God “magic” to me? I mean, c’mon, that sounds a bit ridiculous. But when I really think about it, I see the point that is clearly being made. If I truly put my faith in God, and believe without a shadow of a doubt that He can keep me sober, then I stand a chance at this thing called sobriety! If I want a lovely and fulfilling life of physical and emotional sobriety, I have to trust and have faith that my Higher Power will come through for me. Today, that is exactly what I am choosing to do! One of the many mistakes I have made along the path of sobriety was in not completely turning my will over to the care of my Higher Power. Oh sure, I said I did, and I really believed this to be true. But the truth is this… I turned it over, and then reached out and desperately snatched it right back. So, in essence, I was loaning it out. I have to be willing to give my will completely to my Higher Power. I have to truly believe that God has me in the palm of His hand, and will protect and care for me. To not do so spells disaster. When I look at my life, I realize that I talked a good game. I told others that I believed that my God was looking out for me. But in my bed, late at night unable to sleep, I was tossing and turning with fear and anxiety over whatever was the problem of the day. With that constant worry, I was obviously not trusting and believing that God had my back. I may have asked Him for help, but instead of turning it over, I was trying to take back control and come up with my own solutions. Hell, my past history should be enough to prove to myself that when I try to control situations on my own, I only end up in misery. Today, I am slowly learning and accepting that I need God. 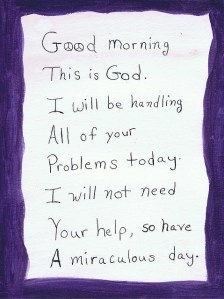 More specifically, I need to trust in Him that He will provide solutions and offer me comfort. I’ve heard it said at meetings… “Let Go and Let God”. I have been struggling with this, while knowing at my very core that this is the piece that has been missing in my life. Tonight, I was flipping channels and came across an old favorite, Joel Osteen. I used to listen to his podcasts while running on the treadmill because not only was it inspiring, but the podcasts are a half hour long which is perfect for my run! 🙂 Tonight’s episode was entitled “Stay in Peace”. He talked about trusting that God will take care of you during even the most tumultuous times. He gave an example of being in the eye of the storm. In a hurricane, while everything is complete chaos, if you are at the very center of the storm, the eye, there is total calmness. He said that when life is crumbling around you, when you feel there is no way out of your problems, stay in peace… stay centered, as if you were in the eye of the storm. Allow everything to occur around you, but stay calm and in peace. I love this. The key idea is to trust that although life will continue to throw you curves, trust in God and know that He will provide… IF you place your complete trust in Him… IF you turn your will over to Him and allow Him to help. Ask for help, and you shall receive. Trust in Him, and He will provide.